THE North East plays a vital role in the thriving UK space sector, according to a Government space industry leader who was speaking at a national conference in Sunderland today (March 28). Claire Barcham, commercial space director with the UK Space Agency, the Government agency responsible for the UK’s civil space programme, was one of several speakers at the conference, which was designed to help businesses capitalise on the growing, multi-million pound space and satellite sector. More than 100 businesses attended the free event, entitled Discover the Possibilities: Into the Blue, at Sunderland’s National Glass Centre to hear how companies could help solve problems facing the marine sector. They heard how satellite data could be used to help save the sea from pollution and global warming, in coastal monitoring and protection, and how we can maximise its use for food and energy. Ms Barcham said: “The North East plays a vital role in the UK space sector and the latest figures show the region contributes £75 million to the total UK space sector income. 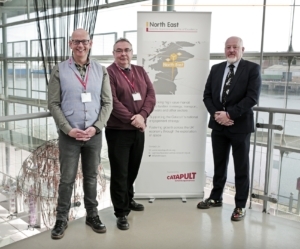 Other speakers at the conference included Sean McCarthy, head of market intelligence at the Satellite Applications Catapult, as well as North East businesses, which gave valuable insight into the industry. They included Ralph “Dinz” Dinsley, executive director of Northern Space & Security (NORSS) in Northumberland, which provides expertise on space object tracking and space situational awareness, and Austen Atkinson, CEO of Durham-based Lexicon Science. 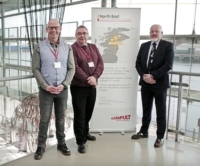 The North East Satellite Applications Centre of Excellence is delivered by Business Durham, the economic development organisation for County Durham, working on behalf of Durham County Council. The centre is one of five across the country and is based at the North East Technology Park (NETPark), in Sedgefield, County Durham.